Long after the hippies were gone, in 1974, was the first year Michael Stuart Ani actually heard Mazatecans whisper the word Desheto. 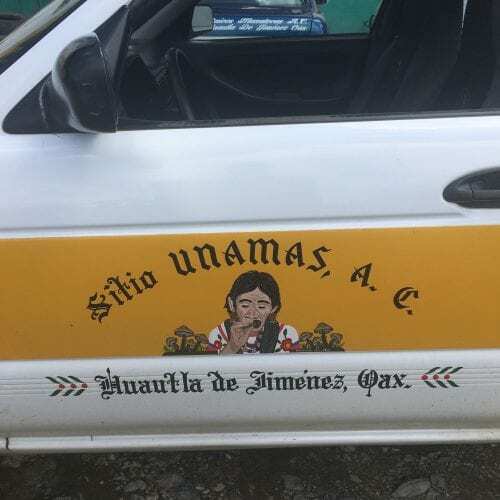 They were questioning their own superstitions starting with turning Maria Sabina into a pariah for performing veladas for outsiders and then the failed commercialization of the Magic Mushroom. In a backlash to ‘progress’, the fear of abandoning the old-time religion took hold and the people believed that the mushroom had turned on them and would no longer speak Mazatec. Some said that Desheto now spoke English, but Michael believes that they unknowingly mistook English for the true archaic language of Desheto’s ancestry. In 1985, Maria Sabina died in Oaxaca City. Although many people believed that she gained wealth performing veladas for the rich and famous, she died so poor, the mayor paid for her hospital room to be filled with flowers. The grande dame of the psychedelic sixties passed with barely a whisper and Desheto and its secret once again returned from the world stage back to the deep cloud forest. A freak hailstorm pummelled the Mazatecan tropical cloud forest in 1988 and after that time it seemed that the sacred mushroom went extinct, meaning that for the next eighteen years they were extremely rare if they existed at all. During this time young people from the area, whose grandparents and parents had converted to Christianity, started a cultural revival and became interested in the “old time religion,” but the sacrament seemed to be gone. What was still there in abundance were San Isidro mushrooms, Psilocybin Cubensis, the notorious Magic Mushroom. Over the course of an incredibly short 18 years of its seeming extinction, the entire belief system derived from the sacred mushroom, which goes back thousands of years, had transformed into a hybrid of the hippie’s festival style. No longer was Desheto involved at all or any of the taboos surrounding this special sacred mushroom. The new Velada ceremony was performed with guitars and group singing and a new mushroom guru: Julieta Casimiro. 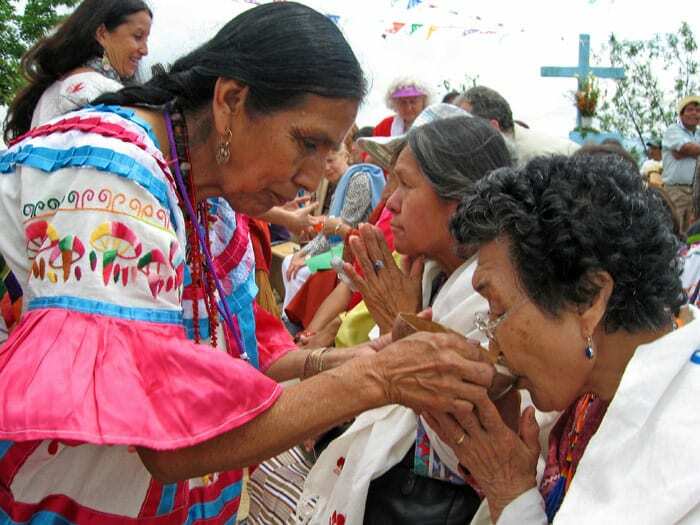 Julieta became the most famous celebrity of Huautla after joining the internationally known Thirteen Sacred Indigenous Grandmothers. Her large-scale mushroom ceremonies, which were somewhere between a velada and the New Age, brought more wealth to her and Huautla than Maria Sabina could have ever dreamed of. Maybe it was true, the mushrooms of white men’s saints really did help her find treasure? Overnight, Huautla, which had lain dormant as a mushroom spore for so many years, began to grow from a tiny backwater pueblo to a mushroom version of a Dr. Suess city, piled upon itself on the side of a mountain. Then in 2006, Desheto returned with the rains after eighteen years and a very long drought. This caused a conflict that has lasted to this day. Those who have adopted the magic mushroom, claim that it can provide the same effect as Desheto, but the traditional don’t believe this for a moment. For them, the magic mushroom has no ties to the history or wisdom buried in the soil of the region. Once again, in 2018 Desheto appears to be going extinct and this time it could be forever. The change came in 2017. After virtually being undisturbed for decades, the back country of the Mazateca is now being transformed with roads and electric poles. Desheto is a creature of the deep cloud forest and now Desheto is losing its terrain. As ‘progress’ arrives, Desheto fades. When Wasson first came to Huautla there was no electricity and Desheto grew nearby. When the road was built and electricity arrived they never grew again in Huatla. Right now, this development is taking place in the entire region. ” Even though Julieta’s way had been Catholicism and mine was the old-time religion, it had never gotten in the way of our laughing, dancing and beer drinking. We had fun together recounting our versions of the history of what the hell happened in the Mazateca and how it affected the rest of the world. Julieta had been certain that Christ could use psilocybin to heal and so San Isidro, the cubensis mushroom had become the sacrament of the day. Julieta grinned, leaned closer and her eyes sparkled as she spoke. With her passing, still another era of the secret story of the Sacred Mushroom has ended and this new era we are entering is a precarious one. If we do not intercede on Desheto’s behalf, a sacrament that may hold the answer to the future survival of humanity, the ability to communicate with the elements of nature, could be gone forever.